Background: Brow bone reduction is done in both men and women. However the techniques may be different based on the amount of brow bone reduction required. 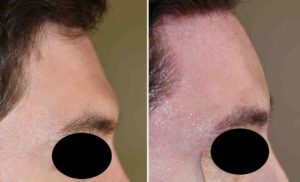 In my experience most men that consider and undergo reduction of their brow bone prominences do so because they are extremely large and have a dramatic impact on the perception of their facial appearance. Strong male brow bones often create a ‘Neanderthal’ or hypermasculine appearance that can make one look angry and/or intimidating. As a result, the brow bone reduction technique needed for most men is the bone flap technique. This is where the outer table of the frontal sinuses (brow bone protrusion) is removed, reshaped and then reimplanted. 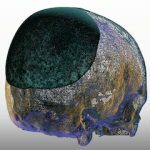 This method produces the most significant amount of brow bone backward movement as there is almost no reasonable limit as two how much the bone can be moved back into a frontal sinus air space. This is different than when a bone burring method is used which is limited to the thickness of the anterior table of the frontal sinus. While the brow bone reduction method selected is important, the surgical incision needed to perform it is also of great aesthetic significance. There are a variety of incisional options based on the frontal hairline density and location, the age of the patient and presence of horizontal forehead wrinkles and of course, patient preference. More times than not in men the incision used is back in the scalp and is know as a coronal incision. While there is no question that a typical and full coronal scalp incision provides maximal surgical access, I have never cared for the long or complete temporal component of the resultant scalp scar. It always ends up as the widest part of the scalp scar. Thus I refer to use a semi-coronal scalp incision that bypasses the need for the lower end of the temporal scalp incision. Case Study: This young male was bothered by his brow bone prominence. He desired completely flat brow bones which blended smoothly into his upper forehead. His preoperative discussion reviewed burring vs bone flap reduction (my decision) and whether to make a hairline incision or that of one looked further back behind the hairline. After reviewing incision and scar pictures he opted for a coronal scalp incision. Under general anesthesia and through a partial or semi-coronal scalp incision, the brow bones exposed by subperiosteal dissection. Using a reciprocating saw, the outer table of the frontal sinus (brow bone protrusion) was removed. The bone flap was reshaped by burring its inner and outer surfaces. The bone edges around the open frontal sinus were also burred around its perimeter to lower its depth. 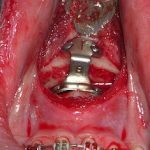 The reshaped bone flap was replaced and secured with a single plate and screws. The reduced profile of the brow bones could be appreciated by comparing their shapes before and immediately after reduction. The thickness of the anterior table of the frontal sinus (3mms) supported the decision to use a bone flap setback technique. It was not thick enough to allow the degree of brow bone flatness that he desired. Burring rarely is effective for a male brow bone reductive surgery unless a significant residual brow bone break is desired. 1) The preoperative decisions in brow bone reduction in men are how to reduce the brow bone and the location of the surgical incisions to do so. 2) Most men require a bone flap setback method for an adequate brow bone reduction result. 3) The incisional access options include a hairline vs semi-coronal approach which is decided by both patient preference and frontal hairline density and location.